The weeping willow tree has an elegant look that is easily recognized for its long, sweeping branches that can reach the ground. Weeping willows (Salix babylonica) are excellent shade trees and are considered one of the first harbingers of spring because their bright green leaves appear before most other trees are ready to bloom. The weeping willow is most often found near streams, in wetlands and in the backyards of many homes. Known as a fast-grower, weeping willows can reach heights of 30 to 75 feet and have a 35-foot spread when fully mature. The weeping willow has a round-shaped crown that appears to droop or weep. The crown is dense and can have a symmetrical canopy and a smooth outline. Leaves are light green in color and have a blade that is 4 to 8 inches long and 2 to 4 inches wide. Willow leaves turn a bright shade of yellow in the fall. The tree produces a brown nutlike fruit and a yellow, unremarkable flower in the spring. Branches droop as the tree matures and require pruning to maintain their strength. Weeping willow trees grow well in most types of lighting but thrive in full sun. The tree can adapt to almost any soil conditions. Plant willow trees in acidic or alkaline soil that is either loamy or sandy. Willows will grow in clay soils as the ground is fairly well-drained. Trees prefer regular amounts of water but are highly drought-resistant. Willows have a good tolerance of salt and will grow well near oceans and along seashores and beaches. Considered a hardy tree, weeping willows grow best in USDA hardiness zones 2 to 9A. 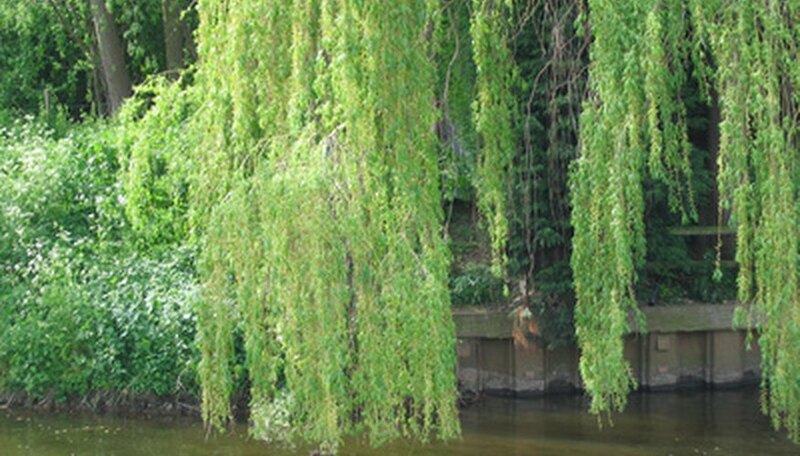 Healthy as they are, the weeping willow has a short life expectancy of just 30 years. Because of their highly aggressive roots, the weeping willow tree should not be planted near underground sewer lines, water lines or close to any septic systems where roots could cause damage. The roots of a weeping willow can spread far, nearly three times the distance from the tree truck to the canopy edge and will often come to the surface. Place willows where they will have enough space to grow and expand. Their large size and traveling roots make them a poor choice for residential lots. They flourish when planted along riverbanks or in large, open areas of parks and fields. The weeping willow is a relatively healthy tree but it is susceptible to a few pests and ailments. They gypsy moth seems to favor the weeping willow and will cause a fair amount of damage to foliage. Scales, borers and caterpillars usually find their way to the weeping willow as well. Treat with the recommended solution of pesticide to be rid of these pests. Root rot infects the root system and causes an early decline of the tree. Willow scab is a fungus that is known to attack young leaves, often killing them in a short time. The fungus enters twigs and destroys the younger shoots. Cankers will appear on the twigs and branches. Physalospora miyabena is another fungus that attacks the willow and, when combined with willow scab, will cause blight. Prune and destroy infected branches. Powdery mildew is also an issue as many willows are found near water, but this condition is not serious. Native Americans once used the willow for medicinal purposes. The young twigs and bark were chewed to ease headache pain. It was also used to ease heartburn and stomach ailments. We now know that the salicylic acid that is extracted from the bark is a pain killer, and it was the basis of modern-day aspirin. Willow sticks and twigs are used in furniture making. Stick furniture is one of the oldest types of furniture made. Chinese paintings dating back 1,000 years show rustic stick chairs being used for seating. Furniture made from willow twigs and branches was popular in the late 1800s through the 1930s. Willows produce wood that is the first choice in the making of cricket bats.